I want to welcome you to my blog as I would welcome friends to my home, through my front door. It is the door to a house that my husband and I just finished remodeling from the studs up. Ha! Did I say finished? Is any home ever completely finished? Or does it just keep evolving? Ok, so my husband and I are evolving our home. A neglected mess when we bought it, it has become a place that has gone from, "You bought that house?" to a home where even the pizza delivery guy says it's the favorite house on his route. But, I digress…Let me welcome you to my front door. My front door was cool to begin with. Sorry if that sounds too bold, but for me it was love at first sight. I fell for the retro asymmetry and the clean lines, even the color wasn't too bad. But the best thing about my door was that the lowest window is just high enough for my little yorkie to peek out, greeting me with her big brown eyes when I get home. Yeah, my door was cool and it made me happy. My Cool Front Door, See the doggy window? But I knew it hadn’t reached its happiness threshold. I knew I could do better. I had an idea of how to transform my door. I wanted the entrance to my home to say something about what was inside, a sneak peek of what is to come. I also wanted to have my address visible on my house, after all the pizza guy has to find the house, and what about finding the house number in an emergency? Safety first! But most of all, I just wanted to drive up to a door that made me really happy! Like these. I did a mock up, drawing my design on the computer, 'cause that's how I roll. 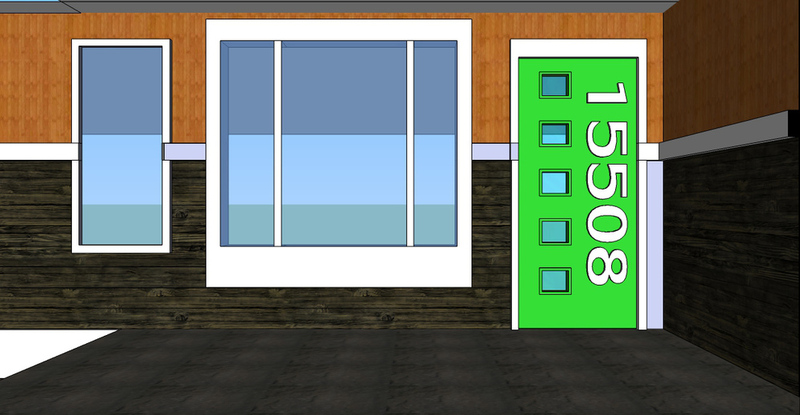 With a digital drawing, it was easy to mess with the scale and get a visual of how the door would look. (I can do this for you, too!). I was also able to figure out the exact dimensions of the numbers. 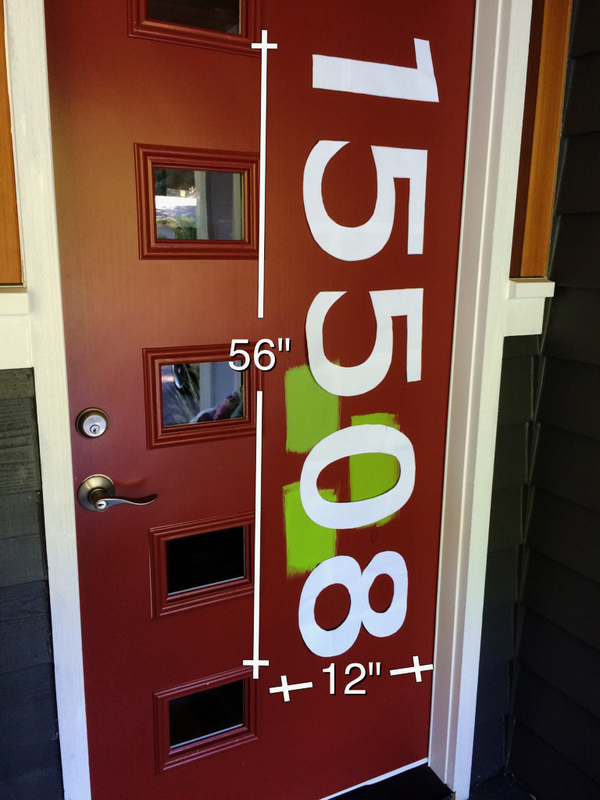 Once I was happy with the size, I printed the numbers out on paper and taped them to the door, giving me and my husband an even better visual. We picked out the paint, trusting that Douglas Fir from Benjamin Moore would boost the happiness factor and pop against the dark paint of the house. I ordered vinyl numbers from a local crafts store, giving them my specifications. And we got to priming and painting. We tried three different colors, settled on Douglas Fir, then primed and painted. Once the door was dry, we hung it and I applied the vinyl numbers. In hindsight, it might have made my life a little easier to put the numbers on while the door was flat, but the numbers took longer than expected and we were feeling a little exposed with out a door... We finished it off with a sleek handle and a high tech Kevo lock that can be controlled with an phone app. Here it is. It's what makes me smile as soon as I pull in my driveway. That and the small dog peeking through the bottom window. My front door has reached its happiness threshold. Let me help you reach yours.